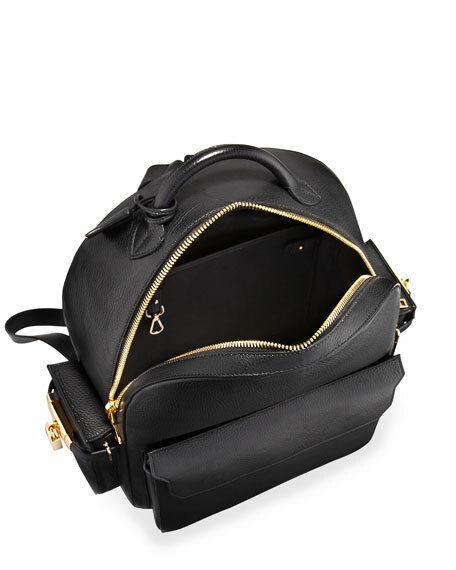 Buscemi men's "PHD" backpack in hand-selected, tumbled Italian leather with painted edges and golden hardware. Rolled top-carry handle; flat, adjustable backpack straps with full-grain pads. Front flap pocket with embossed logo. Side flap pockets; turn-lock closure; covered key. Inside, suede lining; protective laptop sleeve at back wall. Metal feet protect bottom of bag. Full size: 20"H x 18"W x 9"D.
Consumer first, designer secondthat's how Jon Buscemi describes himself. It's no wonder then, that his sneakers and accessories hit precisely on what modern men and women want to wear. Italian leather, hand-painted edges, and luxe details like the signature golden padlock mix with street-inspired influences to create handcrafted sneakers unlike any others. 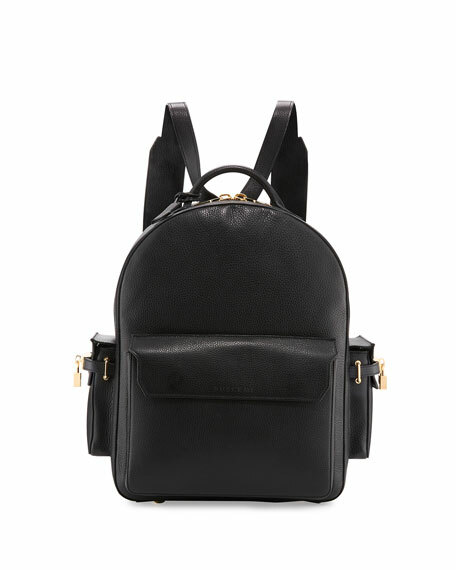 Bally backpack in calf leather with allover logo print. Swiss heritage style. Gunmetal hardware. Adjustable logo-print web shoulder straps. Front and side zip pockets. Flap top secured by adjustable buckles. Drawstring closure. Interior, fabric lining; one pocket. Made in Italy. Ermenegildo Zegna backpack in nylon technical fabric. Pelle Tessuta woven and smooth calf leather accents. Rolled top handle with rings. Moncler nylon canvas and leather backpack with silvertone hardware. Flat top handle, 3" drop. Adjustable shoulder straps. Two-way zip-around top. Moncler nylon canvas and leather backpack with silvertone hardware. Flat top handle, 3" drop. Adjustable shoulder straps. Two-way zip-around top. Top zip pocket; metallic logo detail. Front zip pocket with large logo pull. Interior, padded laptop sleeve; pockets. 16.5"H x 10"W x 6"D. "New Yannick" is imported. Montblanc rucksack backpack in textured leather. Features laptop, cell phone, and technical device pockets. Interior, two writing instrument, two padded slip, and one zip pockets. Textile lining. 12.6"H x 18.1"W x 7"D. Made in Italy.